The twenty-five rectangles I made finally made it to Donna at Crochetville! They’re for the Soften the World Simply Soft Sweepstakes Caron is holding. You can see a picture of my rectangles and the 1000+ rectangles other Crochetvillers have contributed on the 2 for 1 – Warm Up America and Crochetville! thread. 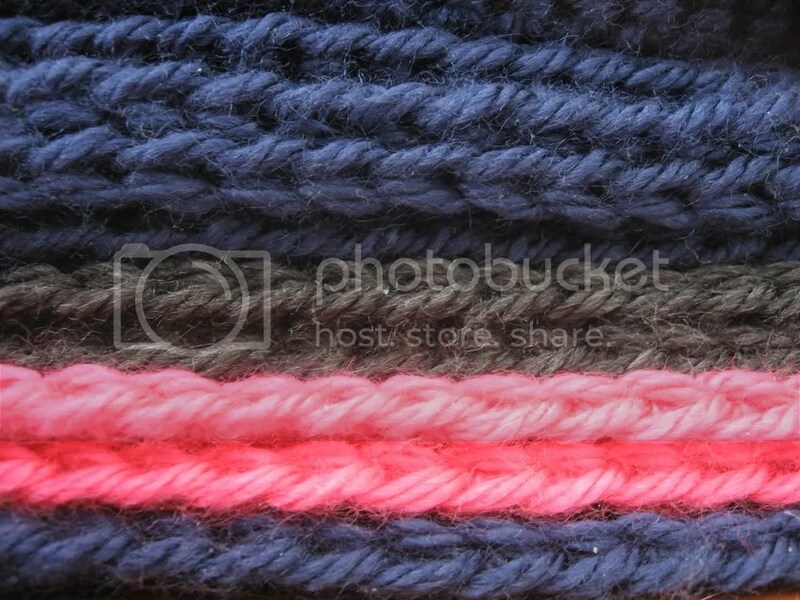 I crocheted every last bit of Simply Soft in my stash, including two unused skeins in navy and remnants from the Cable and Divine Hats. I used Donna’s 7×9″ Rectangle Granny pattern for the majority of the rectangles. I thought about using a bunch of different stitches, but finding the gauge for each pattern was taking too much time. Grannies work up fast and once I figured out the perfect hook size the rest was easy. To get the right gauge I actually left out Row 8 of the pattern. My gauge was still too large with a size F hook and I hate using the size E hook with worsted weight yarn. My yarns splits, the handle is too thin and I generally can’t crochet as quickly. Also, since I can’t stand weaving in lots of ends with a granny-style stitch, all the little yarn balls that I couldn’t stretch to a whole rectangle were made up in plain double crochet. I’m glad I tried Donna’s granny pattern because I learned a new way to join granny-style rounds. For the last corner, you chain one and single crochet to join the round. 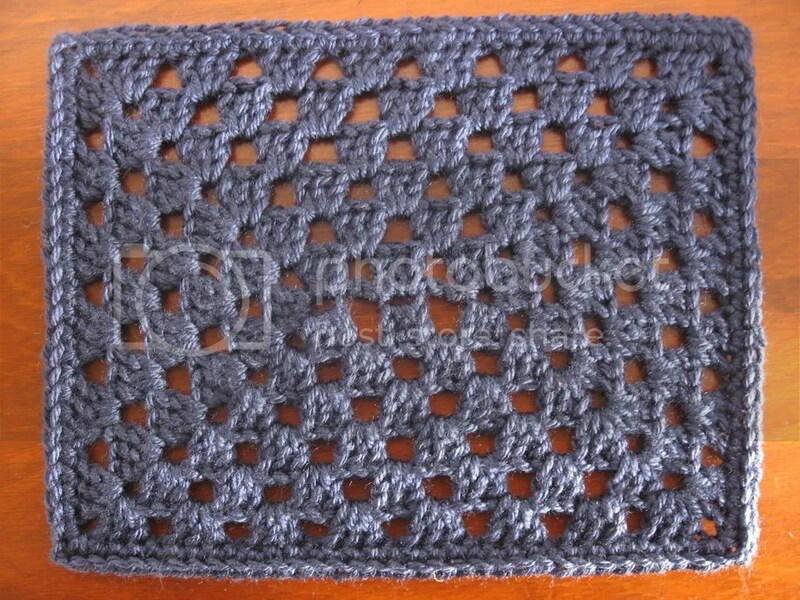 The single crochet ends in the middle of the last corner and from there you make half a corner and continue around. 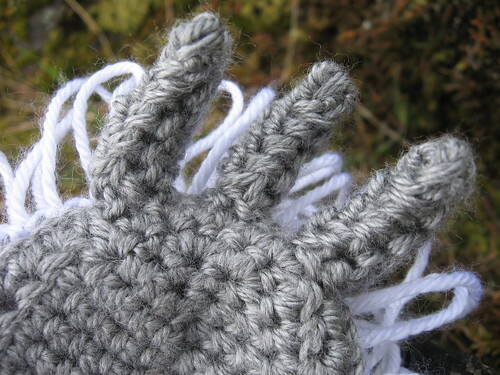 It’s difficult to explain, but simple to use and there’s no slip stitches involved! Anyway, I crocheted twenty-six rectangles total. Twenty-five went to Donna and the last rectangle was sent out in my name for the individuals category. The deadline for individual square entries is May 1, 2008 with a prize of twelve skeins of Caron SS. Crochetville is still accepting rectangles through the mail until April 29, 2008 for their effort to win the $300 cash prize. All the squares collected for the contest will be donated to the Warm Up America charity. Granny Smith Apples are named after Mary Ann Sherwood (1799-1870), who never saw her apples become a commercial apple variety. 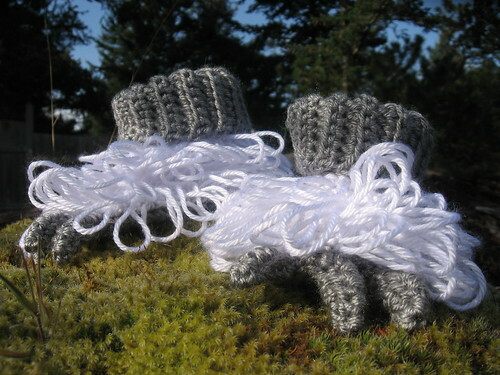 These Abominable Baby Slippers are for my cousin Lindsay’s little boy who just turned one year old. I went ahead and made the 18-24 month size so he’ll hopefully get some use out of them. I’m pretty sure that the loops stitches are too long. The slippers look sort of mop-like. The first time I made the body of the slipper the loops were way too short. I guess I got a little overzealous the second time around. I think the loops will shorten slightly with wear, though. 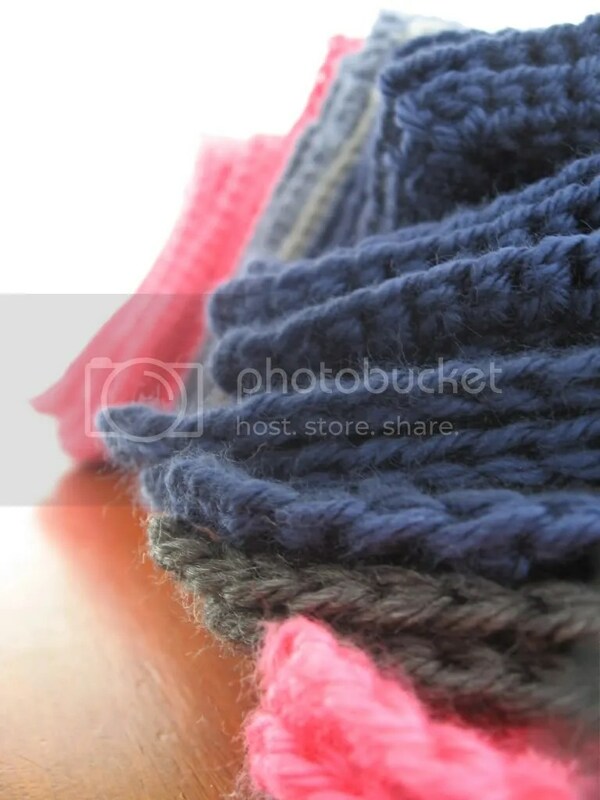 The crochet loop stitch does not secure the actual loops very well. 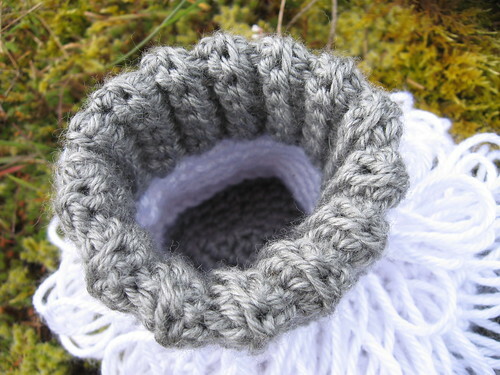 The inside of the slipper is reinforced with another matching layer of crochet to prevent the loops from shortening. Although this made the actual crocheting and assembly more time consuming, I really like how shoe-like the slippers feel. If I had enough gray, I would probably have made a double-crocheted sole too. This pattern was so well thought out. The claws, pattern stitch, crochet reinforcements and a BLO folded cuff all come together easily, making a structually sound little slipper. I would make these again in another color scheme like Andreacrochets. You can see her blue and orange ‘monster’ version on Flickr. Quatchi, a young Sasquatch, is one of the three official Vancouver 2010 Winter Olympic mascots.